Our fleet boasts 165 vehicles consisting of luxury sedans, 7 passenger SUVs, and wheelchair accessible vans. Each vehicle can comfortably accommodate 4 passengers and a moderate amount of luggage. We have over 350 drivers who have all taken special courses and are all GTAA tested and approved. 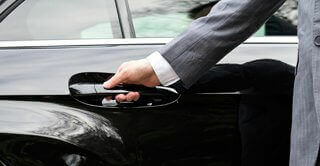 All of our chauffeurs are courteous and professional. Our drivers wear suits, ties, hats and I.D badges making them easily identifiable and they are all covered by a stringent set of company rules. Our drivers of accessible vans have been approved and certified by Transhelp Social Services.